Eight semi-sleeper buses with attached toilet buses will be introduced in the Chennai-Karur-Coimbatore, Chennai-Salem, Chennai-Tiruchy and Chennai-Thanjavur routes. CHENNAI: Commuters travelling along long-distance routes in Tamil Nadu and to neighbouring states will have more comfortable bus travel as the State Express Transport Corporation(SETC) will replace old buses with 60 newly-built ones on Thursday. According to official sources, eight semi-sleeper buses with attached toilets will be introduced in the Chennai-Karur-Coimbatore, Chennai-Salem, Chennai-Tiruchy and Chennai-Thanjavur routes. “These routes have huge transport demand for bus services as the section has limited train connectivity. Two buses for each route in both directions will be introduced in a few days,” said a senior official of the SETC. Presently, the Chennai-Dindigul route has already got buses with toilet facility since July this year. AC bus services and AC sleeper coach services have been monopolised by private omnibus operators across Tamil Nadu until June this year. 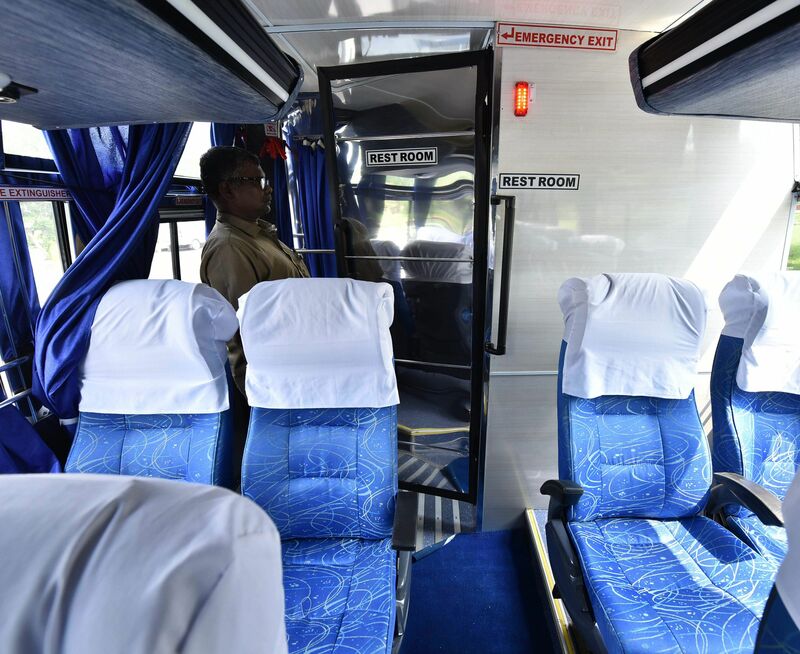 The recently launched AC buses to Bengaluru and other parts of Tamil Nadu have received an overwhelming patronage among commuters though private operators are running luxury Volvo, Volvo multi-axle and the Mercedes Benz services. 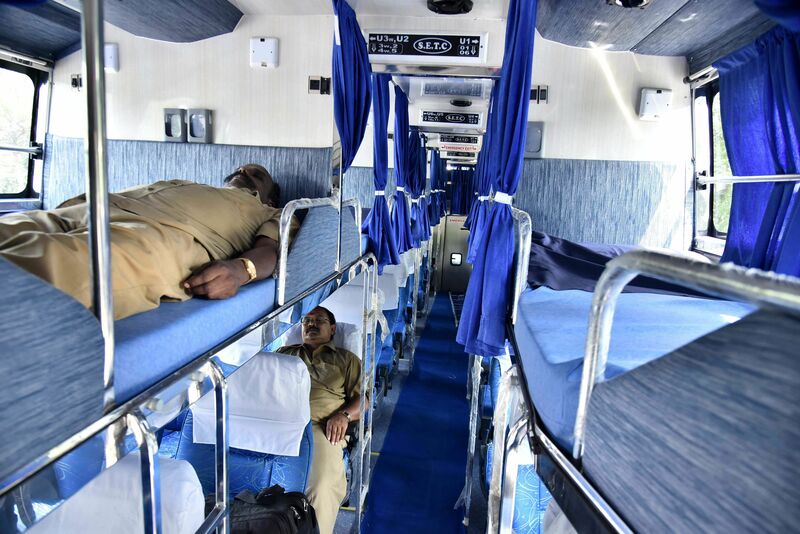 Officials said the new AC sleeper buses would be introduced in the routes of Chennai-Bengaluru, Chennai-Mysuru, Chennai-Ernakulam, Nagercoil-Bengaluru and Velankanni-Bengaluru. “Compared to other routes in Tamil Nadu, AC buses to Bengaluru have got the highest demand from various parts of Tamil Nadu,” added the official sources. Besides, the SETC will replace 38 old buses in 19 routes that run across Tamil Nadu. Particularly, one pair of buses operated from Chennai to Nagercoil and Tirunelveli will be replaced with the new buses. The bus services between Chennai and southern districts, particularly to Tirunelveli and Kanniyakumari districts, remain high throughout the year because of higher migration of population for education and employment. “Of the 38 new buses, 12 will be introduced to various parts of Kanniyakumari and Tirunelveli districts,” added the official. Given the poor or non existent toilet manners of Indians these buses also promise a stench filled journey on the lines of Indian railways' travelling toilets!! !